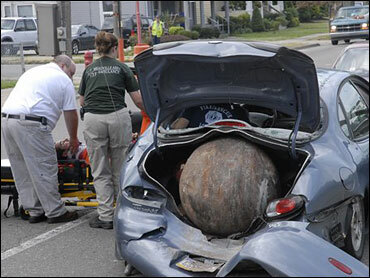 A 1,500-pound wrecking ball broke loose from a crane cable and raced downhill, smashing into several cars and injuring three people before coming to rest in the trunk of a car at an intersection Monday. The wrecking ball, about 3 feet in diameter, was being used to demolish part of a library at Allegheny College when the cable snapped, police said. The crane operator tried unsuccessfully to stop the ball. The ball rolled nearly three-quarters of a mile downhill from the college and damaged vehicles as it bounced from curb to curb, police said. More than a dozen vehicles were damaged, police said. Most of the damaged vehicles were parked, but the wrecking ball slammed into the rear of Alex Habay's car stopped at an intersection, causing a chain reaction accident with two other cars at the traffic light, police said. "All of a sudden the back windshield exploded and I hit the car in front of me," said Habay, 20, a junior at Allegheny College. "I thought a car hit the back of me, but when I turned around, I couldn't see anything." The ball lodged in the trunk of a car at an intersection, pushing the vehicle about 20 feet. "I got out of my car and couldn't believe it when I walked back and saw this giant wrecking ball sitting in the trunk of the last car," said Meadville police Officer Brian Joseph. Meadville is located about 90 miles north of Pittsburgh.